You will be unhappily wed.
To the fourteen year old Rose, eldest daughter of a poor plantation landlord, the fortuneteller's prophecy is both thrilling and laughable. Poorly educated and without a dowry, it seems unlikely that she will find any husband - much less a king. But history tells a different tale, for Rose not only marries into a wealthy aristocratic family, she survives the French Revolution, outlives her first husband and is one day known as Josephine Bonaparte. In this beautifully crafted novel, Sandra Gulland pulls back the veil of history to reveal an extraordinary life. From her simple childhood on the French island of Martinique to her first heady experience in French revolutionary Paris and her unhappy marriage to the unfaithful Alexandre, Rose's destiny lives with a man determined to rule all of France, determined to make her Queen. 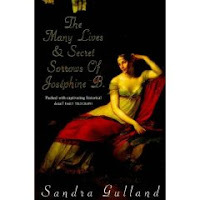 The Many Lives and Secret Sorrows of Josephine B is the first book in the incredible trilogy inspired by the life of Josephine Bonaparte. On the odd occasion that I have read books that are in diary format, particularly historical fiction, they haven't necessarily worked for me, so if I had of realised that this was the format of this book, I probably wouldn't have picked it up. This is, however, one of those books where the diary format really, really works. We meet the legendary Josephine Bonaparte when she is Rose, a young planter's daughter who lives in Martinique. She visits a fortune teller who tells her that she will be married unhappily, she will be a widow, and she will be a queen - all very unlikely given that she is uneducated, and from a poor family. Following tragedy within her family she is however betrothed to a man she has never met before and therefore has to make the trip to France - a country in uproar. She marries Alexandre, Vicomte de Beaurharnais, and eventually provides him with two children, but the marriage is an unhappy one, and he is unfaithful to her many times. Eventually they undertake a legal separation, but there are many custody issues, particularly around their son, Eugene. All of this takes place against a background of revolution, and eventually Josephine has to try and walk the fine line between being a revolutionary (necessary if one wants to keep one's head intact), but still being loyal and doing all she can to save her aristocratic friends. As Alexandre becomes more and more important in government, Rose finds herself under more and more scrutiny because she is still his wife, and when the tide turns against Alexandre they both find themselves in Carmes prison. Even during such a worrying time as that, Alexandre and Rose still find ways to torment each other, until finally Alexandre's name is on the list - which means that he is on his way to meet Madame Guillotine. Rose's name is also called, but she is deemed too sick to be killed, and luckily, through her influential friends, she is released, thus narrowly avoiding the same fate as her husband. Once out of prison, life in post revolutionary Paris begins, and Rose, now a widow, becomes the mistress of several men. Whilst never rich, she does have influence, and does seem to fraternise with many men who form part of the new government. It is through these men that she meets Napoleon. At first, she is unimpressed, but as he pursues her, she eventually begins to see some advantages to being linked with this man. This book is the first book in a trilogy, and focuses mainly on Rose's life prior to meeting Napoleon. He only appears in the last few chapters of the book, presumably as a kind of teaser for the next book in the series. And if that was the intention then it definitely works, because I have already requested the next book in the series. Gulland is very successful at giving some idea of what life must have been like for people in France during this turbulent time - never knowing whether or not your neighbour that you have known for years might be the one person who will turn you in for disloyalty, not knowing if each time you see your friends may be the last time you see them, struggling to provide food and education to your children. Through it all Rose manages to maintain her dignity, humour and grace. Overall, this was a very entertaining read, about a very interesting woman who lived in very turbulent times, and is still remembered today. I have had this book since March of last year. I bought it when it first came out as a 3-in-1 book, and it is has been on my to be read pile since. I have no idea why, but I was on my way out the door the other night to work, and while I had a book picked out to read, I came back downstairs and selected this one off my shelf. It was really random and a spur of the moment thought, but I am glad that I read it! I have a strong liking for historical fiction novels, so when I heard about this trilogy I knew I had to eventually buy it. Other than Naomi Novik's historical fantasy series about the Napoleonic wars, this is the first time that I can remember reading a book about this particular period in time. It was not an intentional thing, but for whatever reason, this is the first time I got around to reading about this time period. I really liked this book. Let me point out that I am totally clueless. I was reading the book, and the main character in the novel is named Rose. It never even came to mind that it should be Josephine. I really wonder about myself sometimes, as it was clear that she was going to be the main character in all three books. It was not until she met Napoleon that her name became Josephine. I am still kicking myself for being so totally unobservant! It is amazing what Josephine becomes in this novel. She begins the book living with her family, having never even been to France before, but one of her aunts sends a letter looking for one of her nieces to marry a young man that her aunt knows, Alexandre. For a large period of the novel, he is an important person in France's history. This naive young girl comes to France, and winds up married to a very important man. Too bad that he is not a very nice husband, and treats her more like a friend than anything else. He does give her two wonderful children, that present themselves and their personalities several times during the course of the book. It is hard to believe that the woman that marries Alexandre becomes Empress of France, because she can be quite naive. She is brave, but she holds onto romantic notions that make you wonder how she ever gets ahead. She grows up, though. During the course of just this first book you see her go from this naive little girl to this very important woman in France. She may not have a lot of money, but she is very brave and puts her fellow man ahead of herself more times than I can count. She does not seem to care what happens to herself, she is more interested in helping others. She makes wonderful connections in doing so, though, that help her out in the end. I have to say, I know who Napoleon is, of course, but he was never given a lot of study in the history courses that I took. As far as I can tell, Sandra Gulland put a lot of time into making this diary-format book as close to accurate as possible. I learned a lot, and plan to track down a non-fiction book in the future to get a clearer idea of the validity of this historical fiction novel. Overall, a very enjoyable start to a trilogy. She is supposed to have a new book out one of these days. I loved this trilogy, though, very well-written.